Corral Hollow Family Dental provides prompt, comprehensive dental care for emergencies in Tracy. Our experienced dental team is equipped to handle all types of dental emergency care so if you are in need of an emergency dentist in Tracy, it is important to contact us at the first sign of complications. We want to alleviate your pain and treat your condition quickly, whether you are suffering from an injury or infection. If you're experiencing a dental emergency, call Corral Hollow Family Dental at (209) 834-3990! Our dentists work hard to preserve your natural teeth, and if one or more of them are at risk due to extensive decay or trauma, we provide treatments that improve your chances of maintaining your natural smile. Our dentists are excellent diagnosticians and can get to the bottom of your dental issue. Root Canal Therapy – If the deep pulp of a tooth has been compromised because of a large cavity, or injury, root canal therapy can often save the tooth and avoid the need for extraction. Replantation – If you can get to our office quickly, we can sometimes replant a tooth that has been knocked out (avulsed) but time is of the essence. Extraction – If the tooth can’t be saved, extraction will be necessary. Restoration – If a tooth is broken or damaged, we can repair it with a top-quality crown. We also use crowns to cap a tooth treated with root canal therapy to renew its original function. Tooth Replacement Options – If one or more teeth are lost, we offer a range of options to replace them. From traditional bridges to dental implants, we have your solution. If you are experiencing a dental emergency, call our office without delay. However, if swelling, bleeding pain is severe, or if you are having difficulty breathing, go to an emergency room for treatment immediately. Until your appointment, the following measures can be taken to reduce discomfort, preserve the tooth, and minimize your risk of serious complications. Dislodged or Knocked Out Tooth or Crown - If a tooth is completely knocked out, pick it up by the crown, and avoiding the root. Gently rinse the tooth and carefully place it back into the socket. If this isn’t possible or if the patient is a child, put the tooth in a glass of milk or some lightly salted water. Call us immediately, and we will give further instructions. Broken Tooth - Rinse with salt water and apply gauze if there is any bleeding. Do not use a topical pain reliever as it can burn. If pain, swelling or bleeding persists or becomes unmanageable before an appointment with the dentist can be made, consider visiting the emergency room. Toothaches and Abscesses - When experiencing a toothache, pain relief is the goal, until seeing the dentist. Rinsing with water, using a topical pain reliever, and if swelling occurs, applying a cold compress to the cheek can help reduce symptoms. Abscesses are serious and should be treated by a dental or medical professional quickly. Until then, rinse with salt water. Corral Hollow Family Dental recommends including dental emergency items with your first-aid kit. Temporary filling and crown repair kits, dental pain relievers, and tooth preserving solutions are available from many local drug stores or online. Wearing a mouth guard during physical activities greatly reduces the risk of dental injuries. Also, avoid chewing on non-edible items or using your teeth as a tool. 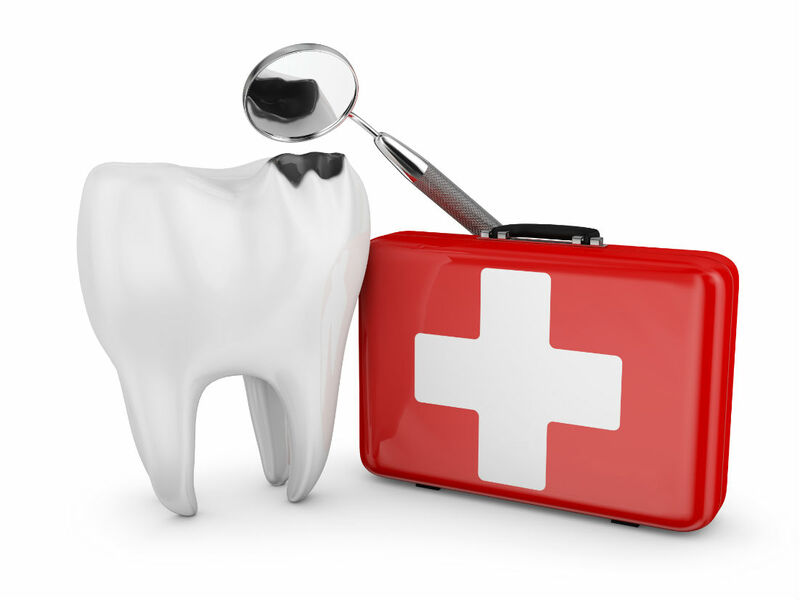 Experiencing a dental emergency in Tracy, CA? Call Corral Hollow Family Dental Now!